This is the box art when viewed in first-person mode. The motion controls in Mario Kart Wii divide opinion amongst gamers, so it'll be fascinating to see the reaction to the new first-person gyroscope controls in December's Mario Kart 7. The new mode is briefly shown in the new trailer below, alongside new additions such as the Fire Flower power-up and returning favourites too. There's fresh screenshots even further down as well, because we're good to you like that. 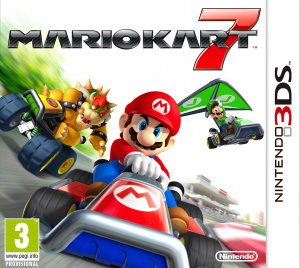 Mario Kart 7 is due out in early December. The fire flower looks like a great new power up but I doubt I'll use the gyro controls as they're only in first person mode and I don't like first person view in racing games. OH MAN I HAVE TO GET THAT. 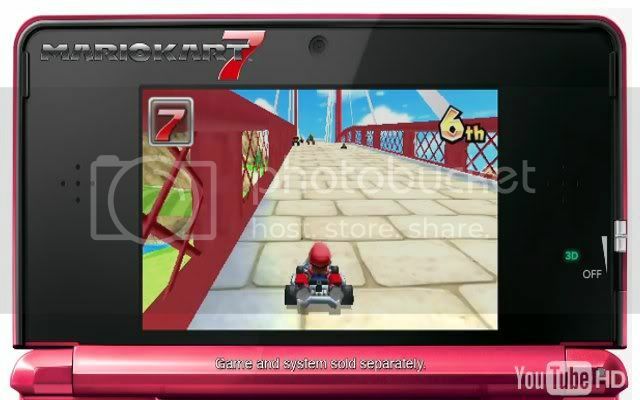 It's gonna injure my wallet, but I've been waiting for a racer on 3DS with gyroscope controls. It may be a cheap gimmick, but it's a FUN cheap gimmick. I already have it on my Christmas list! Can't wait to see that in 3D! Oh wow, love that first-person perspective! I hope the tricks don't involve shaking the 3DS (like they do for the Wii version). My son keeps shaking his 3DS when he plays MK DS and I fear the screen will break off. Can't wait for this one. Hope it plays as well as the DS game. I can imagine someone being very cheap on wifi with that fire flower . @6 were my first thoughts on tricks, too. But I'll expect them to react on slightest movements. So no stupid shaking and just little glimpses instead. The fire flower power-up looks great. Seems odd looking at it now that it hasn't been thought of before. for me, mario kart is a multiplayer experience, with people in the same room having fun. not sure its suited on handheld, as the one of advance and DS didnt give me chills or anything. But the online looks solid, the new characters are interesting and the new items look great. Can't wait for this! The footage confirms that the blue shell and the lightning bolt are in the game. Glad to see the stunts from MK Wii are here to stay, although I don't exactly feel the same about the coins. They were an unnecessary pain in the bum in MK Super Circuit, and I'm glad that game gave you the option to turn them off during the Quick Race mode. I hope MK 7 will allow you to do the same. dont use 1st person in racers.but might be good in actual 3d. The level design looks reminiscent of Diddy Kong Racing, which means that they look more interesting than any of the previous Mario Kart games. I just noticed that Yoshi is driving a bumblebee cart in one of the pictures.. Mario galaxy bee character confirmed? Karts are more often than not character based. So should be possible. Before it looked pretty meh, but... I'm actually really excited for this now. Bring on December! Has it really taken this long for MK to get cockpit view? Crazy. Officially pumped! These trailers are gonna be on the eShop. Please try and keep up this time, NOE! wow 18 you have some good analysing there. Wanna have my bullet bill character now! Has any one else noticed the that there's a red 7 like the one in the logo as an item? There's also a Super Leaf! I can't wait to see how you use the Super Leaf. It's obvious to take advantage of the gyroscope, I just wish I didn't have to be in first-person view to do it. As for 3D, WOOT!!! Really nice observation man! never noticed that. So the title actually has some kind of context to the game and is not just a bland seven. Haven't seen any interesting vehicles yet. Hopefully they're saving them up. I'd love to see some additional content like that on the DS version, particularly the missions that added so much to the gameplay. I'm totally with you on that dude! I'd love to have missions again. That's one of my favorite thing in the DS version. It was a really nice little singplayer thing. I hope they ad it to this one too. After every few installments of the Mario Kart series, I feel Lakitu's job is getting more and more simpler. Back then he used to pick you up from falling into pits and streams but now with hang-glider and water booster it now makes Lakitu's job a whole lot easier. Now he don't have to worry about picking you up from underwater anymore. Looks amazing, but two things I am hoping for, first person without gyroscope control, and the hands of the character on the wheel in first person! I hope that this vid will be on the eshop for U.S.
Oh November/December, how I yearn for you to be here already. My bank account will say otherwise, though. It's not entirely new, DD had fireballs (for Mario/Luigi). Would've been better if they used the ice flower, that could temporarily frost over the road's surface imo. I'll have to buy a 3DS for this now, it's looking great. Finally a game to beat the DS version. Lakitu's job is going to be a lot harder for this game. He's gonna be a playable character! I thought Nintendo fans hated anything that was in first person that wasn't Metroid. If they are adding a first person mode, they might as well improve the textures of the pavement. On my Christmas list, I'm buying Super Mario Land 3D when it comes out so I'll wait for M.K. Did anyone else notice that the blue shell apparently has no wings? Watch the beginning closely if you don't see it. Did anyone notice that when the trailer is showing first-person view, the star is used repeatedly like the fire flower? Oh I hope that's not true! I want this game so I can finally get some good online play with my 3DS. IKR? What type of Nintendo fan likes FPSes (other than me)? Anyway, I'm really glad the blue shell has been nerfed. This will be great! LOL at the caption below the box art! @26 The title has never been bland. It's a clever poke at Windows 7. The first person + gyro controls has me intrigued. Would like to try a fleshed out flight sim using that setup. Nice catch on the red 7 and Super Leaf! Also, there was an interview with series-producer Hideki Konno which showed Metal Mario and Lakitu as playable characters in action. Metal Mario's kart and glider turn into solid metal (which most here probably know), and Lakitu has a cute little kart made from a cloud! There will be 16 new tracks, and Wuhu Island will only have one massive lap instead of three. Article about it can be found here. It'd probably be a good idea for Nintendo Life to include the video in this article or something, since it shows off Lakitu and gives a slightly more in-depth look at the game. Or at least do a screen grab of Lakitu and add it to the Screen Shot gallery if you could? EDIT2: Fixed broken link. Sorry. @gabrielwoj: Wario is going to be in the game. I saw him racing in the Waluigi Pinball track. Watch the Mario Kart 7 interview to see him for yourself. I am honestly very excited for this game. 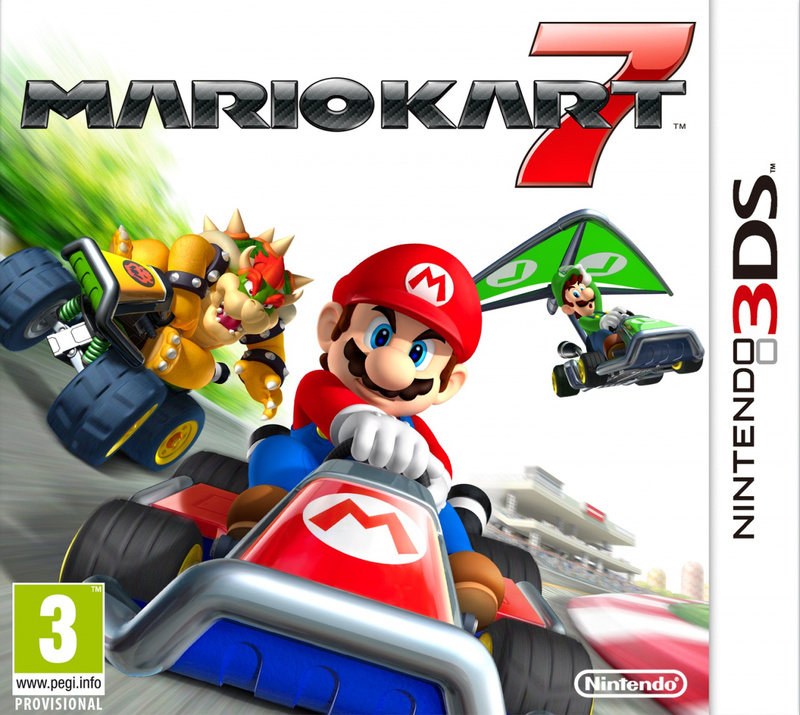 Mario Kart DS was great, and I have a feeling that this new handheld installment will be even better. December can't come soon enough! Thanks to the first-person perspective, i want to get hit by a blue shell now just to see the view go crazy. Heres to hoping the online play is smooth and lag free. Nice box-art. Nice trailer! And the fire flower is a cool addition! Very nice box-art. This will be my Christmas present!! I'd think if I got hit by a blue shell whilst in first-person, I'd get dizzy. Or upchuck my lunch. Or scream like a little girl in amazement. im wondering how would you do tricks in this game because if you shake the 3DS, the top screen is sure to break.